The main message was echoed by others, such as the BBC. 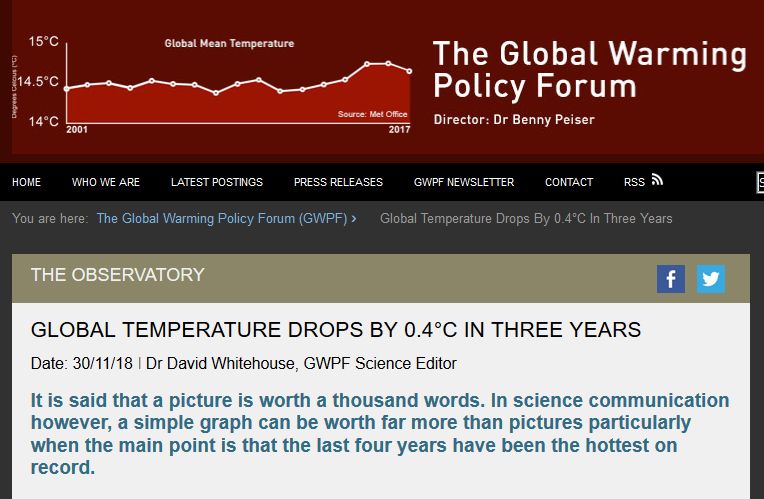 It all goes to show how temperature data can be misrepresented if you don’t show the temperature data itself. 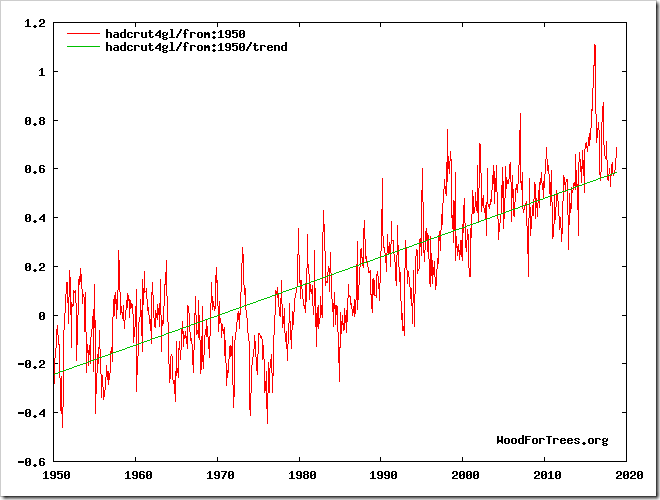 Fig 1 is the HadCRUT4 monthly global temperature from the UK Met Office. As you can see a graph tells a very different story. The past decade has a climate change contribution but what elevates the past four years above the previous ones is an El Nino event, the strongest one on record. As we have said many time before an El Nino is not a climatic phenomenon, it is weather. What’s more, after its peak in 2016 the global temperature has fallen by around 0.4° C. The past four years being the warmest on record is true, but it has been primarily due to the 2015/16 super El Nino. If 2019 develops an El Nino and is warmer than 2018 then this has nothing to do with the ‘State of the Climate,’ but everything to do with annual weather variations. It is sad to see the WMO descend into ‘Fake News’ territory, but sadder still to see science reporters regurgitating it without any form of analysis or critical thinking. A decade ago most financial journalists did the same. Thankfully many are much better now and they would never take an alarmist report from the Bank of England, for example, at face value without digging into the figures. This claim clearly is not compatible with the historical data. So why does Matt McGrath, who wrote the BBC report, simply regurgitate the WMO claims instead of challenging them? Am I the only one to find it ironic that in the same news programme the BBC can trumpet (yet again !) global warming propaganda and also the news that 50 000 additional deaths occurred last winter due to the cold weather !! Ah yes, but they don’t do joined up thinking. As far as the BBC is concerned, 50,000 excess winter deaths isn’t really climate related, it’s down to Tory austerity and NHS underfunding and a bit of winter weather. If there were 50,000 excess summer deaths then that, of course, would be climate related. Hot=climate; cold=weather. Simples! Do they not get round that by renaming it “climate change”? 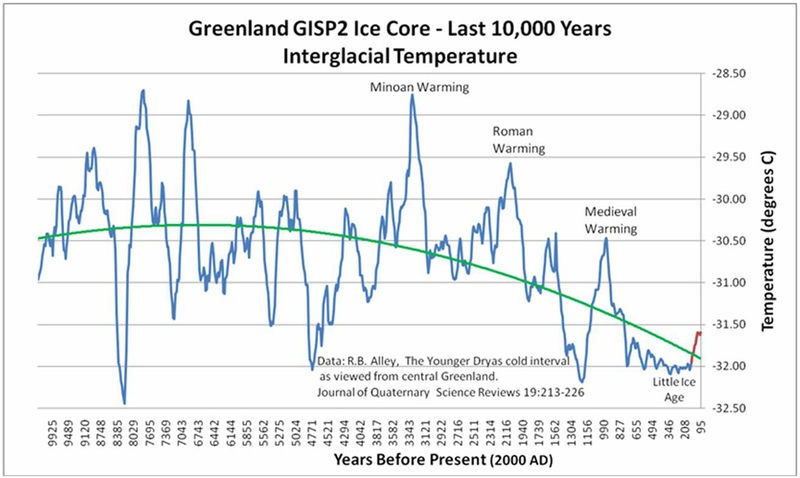 It is an inevitability that more hot days occur in recent history, as the world temperature is rising slowly (about 1 deg K/ Century) after the LIA: so the peaks will also rise. The value of the slope is debatable and whether it is simply linear also, it is physically more likely to be exponential, but if the average is rising there will be more record-high days. What is patently obvious is that the slow rise has no relationship to CO2: only over the 1990s did the two correlate well (spurious correlations again). In the US they have had the USCRN network since 2006, which I trust. It shows 2018 to date as cooler than 2012 and 2016 and about the same as 2006 and 2007. All fo that promises accurate and reliable data sets, would that we had a network designed to similar standard, away from UHI effects and here in the UK. *It’s actually HPFMWM, Hocus Pocus Magic, With Mirrors. According to the UAH data set the average temperature so far this year is 0.22 degrees (including data for November). Assuming there isn’t an increase of aprox. 0.3 degrees in December then 2018 will be 6th warmest, cooler than 1998 and 2010. Bet this won’t get reported by the BBC, Guardian etc.